Chrome plated cover and retainer plate. 3/4 Taper Steering Wheel Adapter. 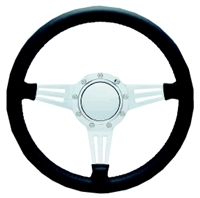 This steering wheel adapter is CNC Machined out of Billet 6061-T6 Aluminum. Designed to cover your nut on your steering wheel. The Classic features three holes per spoke and an extra thick foam cushion grip. Our Helm bezel Bezel is a direct replacement for the black plastic bezel on the Uflex Rack and Rotory systems. 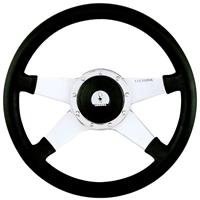 Steering Wheel Adapter for the Lecarra 9 bolt Steering Wheel. These wheels are replacement wheels for the Formuling Steering Wheels. The Mark 4 is made out of one piece billet 6061 T-6 aluminum. The Mark 9 is made out of one piece billet 6061 T-6 aluminum.